Duluth’s earliest metal-fabricating shop was a modest affair that built rail cars for Jay Cooke’s Great Northern Railway. In February 1873 J. B. Culver, Luther Mendenhall, J. D. Ray, J. C. Hunter, and W. W. Spalding formed the Duluth Blast Furnace Company and built him the city’s first blast furnace — which allowed a foundry to make its own pig iron — on Rice’s Point. They then lured Pittsburgh’s John H. Schoenberger to operate the Schoenberger and Bryant Car Company Foundry. Before he entered the grain trade, George Barnum contracted with Duluth Blast Furnace to bring ore to Duluth from Marquette, Michigan (Minnesota’s Iron Range had yet to open) using the steamships Manistee and Metropolis, the first two large steamers owned by Duluthians to operate on the Great Lakes. 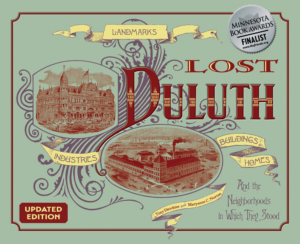 But, like most other Duluth businesses, it failed in late 1873 in the wake of the national financial panic. The Duluth Iron & Steel Company operated on the site from 1884 to 1888 before moving to West Duluth. The new facility sat along the St. Louis Bay between Fifty-Sixth and Fifty-Ninth Avenues West. Designed by engineer John Berkenbine, the complex covered twenty-three acres and included a brick engine house and two deepwater docks. 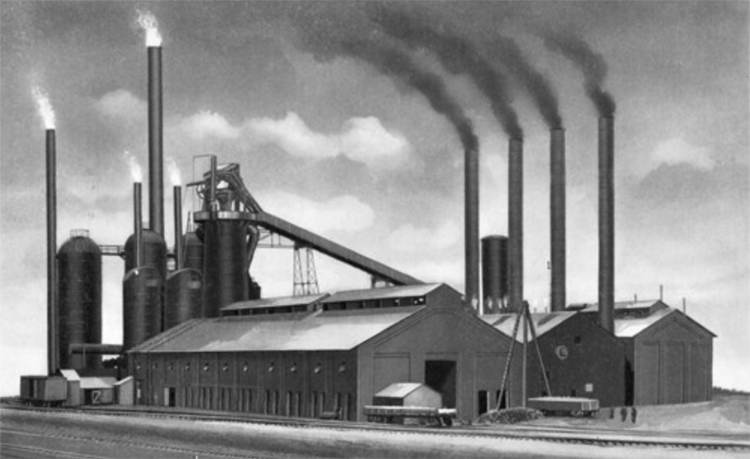 The company reformed as West Duluth Blast Furnace in 1892 but closed in 1895 as a result of the 1893 financial panic. In 1902 Captain A. B. Wolvin and his associates incorporated Zenith Furnace and rebuilt the plant to produce pig iron and its byproducts — coal tar, ammonia, and coal gas — all of which could be used by other manufacturers in West Duluth. They also added a coal dock and began distributing coal. The company also had its own rail system to receive and deliver freight cars to both the Northern Pacific and Soo Line railways. Wolvin left the company after a few years and credit for the plant’s early success went to Fred C. Harris, who became general superintendent of Zenith Furnace in 1906. Additions to the facility in 1905 and 1908 created one of the largest industries in Duluth. In 1924 Zenith employed four hundred workers. In 1948 the company became a division of Interlake Iron Company and by 1955 was the country’s largest producer of pig iron. But dramatic reductions in the demand for pig iron forced Zenith Furnace to close in 1962. Interlake failed in 1964, the same year part of the complex was demolished. A portion of the facility became Hallett Dock #6. The site was declared a Superfund site in 1983 because of coal tar and chemical pollutants on the site and in the St. Louis River. Today the area is mostly vacant. Iron Bay Works was a short lived iron-and-steel manufacturing company which moved to Duluth from Marquette, Michigan, in 1889 and built a new brick facility at Fiftieth Avenue West and Ramsey Street along the St. Louis Bay. The building was several stories high, seventy-five feet wide and two hundred feet long, and included a blacksmith shop, boiler shop, pattern room, drawing room, and storeroom. Prominent Duluthians D. H. Merritt, F. W. Merritt, and former mayor Clinton Markell became the company’s officers, overseeing the production machinery for iron mines, many in which the Merritt family was heavily invested. As it did with other Merritt investments, the financial crisis of 1893 brought an end to the Iron Bay Works. National Iron, founded in 1883 on Rice’s Point along Garfield Avenue, purchased and moved into the Iron Bay buildings in 1902. National Iron grew quickly in their new location, expanding to manufacture machinery for mining, logging, and road construction and enjoying world-wide distribution of its machinery. In 1953 National Iron merged with Pettibone Mulliken Corporation of Chicago. An international downturn in the mining industry forced the facility to close in 1983, and Davidson Printing moved into the facility two years later. Davidson was forced to move out in 1993 when the complex was demolished to make room for the Interstate 35 expansion. Founded in 1867 in Marinette, Wisconsin, by Dewitt Clinton Prescott the Marinette Iron Company moved to the blossoming Village of West Duluth in 1890. Developers imagined the new town as the future center of metal fabrication and other industrial concerns, the “Pittsburgh of the Northwest.” Marinette built a foundry, machine shops, and carpentry shops — all served by a rail system — at 200 North Fiftieth Avenue West to produce sawmill machinery and marine engines. One of its engines, outfitted for the Colgate (designed by Captain Alexander McDougall), was said to be “the finest marine engine ever put into a whaleback steamer.” Again the financial panic of 1893 cost West Duluth a business, with Marinette operating under receivership until 1898. Its last contract was to build the motors and pumps that operate Duluth’s Lakewood Pumping Station. In 1900 Union Match Company moved into the facility. Charles P. Craig, brothers James and Daniel Cass, and others — including future mayor Samuel F. Snively — formed the Clyde Iron Company in 1889 to smelt iron and other metals and manufacture engines, boilers, and machinery “of all descriptions.” (According to lore, “Clyde” refers to a river in Scotland.) They then hired Oliver Traphagen to design a facility at 304-108 South Lake Avenue. In 1902, after being purchased a year earlier by the Northwestern Supply Company, the firm’s official name became the Clyde Iron Works. That same year it began marketing its McGiffert Log Loader, which loaded logs onto railroad cars, and almost at once “completely revolutionized the log handling industry.” The machine, which could be run by unskilled workers, eliminated a great deal of manual labor. Sales quickly expanded the operation, forcing Clyde to move to a new facility at Twenty-Ninth Avenue West and Superior Street in Duluth’s West End. Clyde then began producing modern hoisting equipment, becoming the first company to use internal combustion engines for hoisting. Its hoists, derricks, and cranes built bridges, tunnels, and buildings, including the Grand Coulee Dam, the Boulder Dam, the Golden Gate Bridge, and New York’s Empire State Building, Radio City Music Hall, and United Nations Building. They became best known for the Clyde Whirley Crane, which could revolve 360 degrees. In the 1940s Clyde retooled for the war effort, but for the most part produced essentially the same type of equipment they had been specializing in for years, its four hundred employees working around the clock. Their efforts earned Clyde the Army-Navy “E” award for “outstanding machine production, engineering ability, efficiency and for the high character and workmanship of their products.” Each Clyde employee proudly wore an “E” pin. In 1961 the American Bridge Company ordered a portable hoist from Clyde to help them build the Verrazano-Narrows Bridge in New York Harbor, the longest suspension bridge in the world at the time. The hoist itself was also believed to be the largest ever built. Throughout its entire history the ownership of Clyde traded hands time and again. In 1985 Clyde merged with the marine division of American Hoist & Derrick. Operations moved to St. Paul, Minnesota, and the firm was rechristened AmClyde. The Duluth facility closed. After changing hands several times, local businessman Alessandro Giuliani purchased the property. While some of the complex has been demolished, several buildings survive, and Giuliani adapted the building for reuse and renamed the facility Clyde Park, currently a restaurant and event venue with plans for a brewery and bakery to open in the nearby surviving Duluth Brewing & Malting bottling house. The Clyde offices also survive as the home of Stewart’s Sporting Goods and offices. Today much of the former Clyde Iron facility is occupied by the Duluth Heritage Sports Center. In 1890 the Duluth Daily Northwestern reported that Colonel H. A. Frambach’s Atlas Iron & Brass Works of Kaukauna, Wisconsin, had been purchased by members of the Duluth Business Men’s Association. Frambach stayed behind to run his Eagle Paper Mill, and the new owners relocated the business’s equipment in New Duluth, where Commonwealth Avenue ends at the St. Louis River, opening under the same name. While the colonel made a fortune milling paper (and was inducted into the Paper Industry International Hall of Fame in 2011), Atlas failed in the 1893 financial panic. Western Steel Products later moved into the Atlas Iron & Brass Works building, which became part of the Coolerator company in 1935.